The Rim of the World Drive is a 101-mile-long scenic highway on the South side of the San Bernardino Mountains, first dedicated in 1915. At the very crest of the highway, it reaches a height of 7000-feet and affords spectacular views of the Inland Empire region and on a clear day Los Angeles is visible. 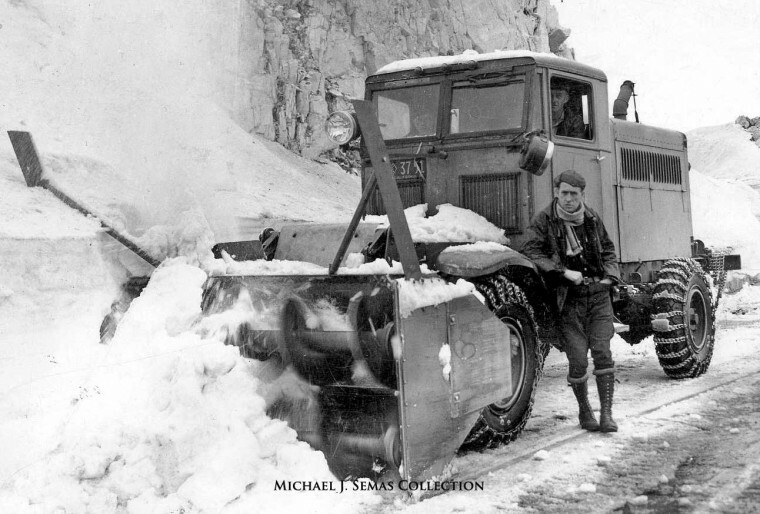 This circa mid-1930s image by the Roscraft Studios & Camera Shop in Crestline, California, taken on the Drive, shows a very large California Highway Department Sno-Go snowblower. The machine was built along the lines of a 1928 design by Dan Wandscheer of Dubuque, Iowa, that he patented. 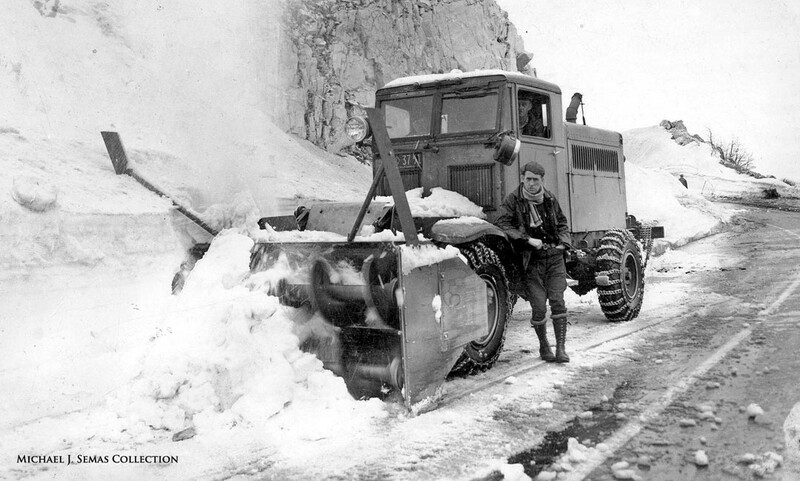 Enlargeable image of the California Highway Department Sno-Go snowblower. The Klauer Manufacturing Company, also of Dubuque bought the patent rights from Wandscheer and started manufacturing the Sno-Go in 1928. Information about the early machines is limited, but a reference to a three-auger 1928 model states that it is powered by a Climax R6U, 6-cylinder 1200 c.i. engine; it would consume 175 gallons of fuel every 2 to 2.5-hours. 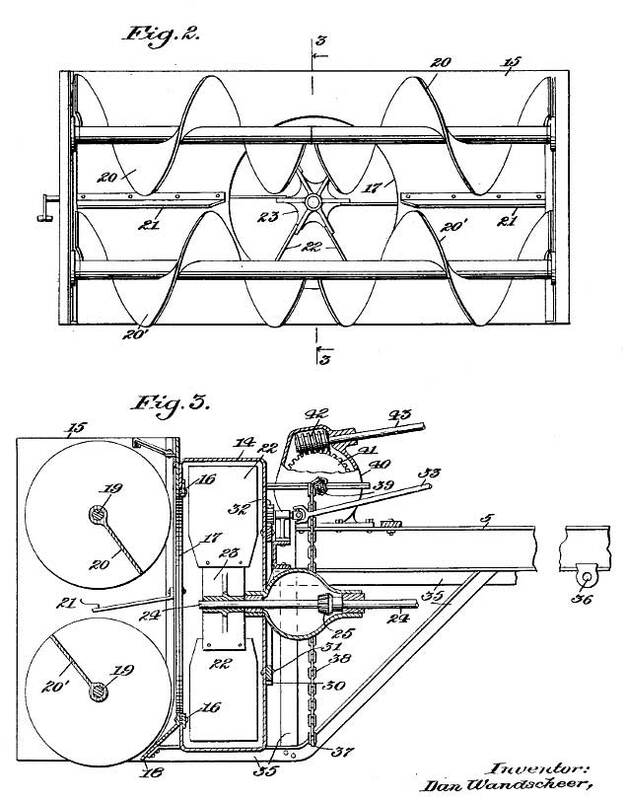 The 1928 patent application drawings (below) of a two-auger machine gives a general overview of its construction. The rear-mounted engine powered a transfer case that drove the blowers and augers directly, and the rear wheels through a transmission. You can view another later Sno-Go along with ten other interesting large snow removal machines in a series of earlier articles. The photo is courtesy of the Michael J. Semas collection. 1928 patent application drawings of the Dan Wandscheer design that was granted on Nov. 1, 1932. This entry was posted in Trucks, Buses and Equipment and tagged Dubuque Iowa, Klauer Manufacturing Company, Rim Of The World Highway, Sno-Go Snowblower. A collector up in Maine has a nice 1933 Klauer Model F that is very similar to this one. Needless to say, it’s very impressive. He has some other really big stuff including a 1934 Linn half track equipped with an enormous V-plow and both wings and a custom-built 1965 Kenworth 884-C that was originally ordered by Morton-Thiokol to haul rocket components around their plant in Utah. Makes me wonder if it might be the same unit that’s in your photos. I don’t think there could have been very many of these things produced. Wow! Kenworth 884 brings back spotty memories. Once worked at Kenworth on a custom built 884. Only closer to 1990, so a different truck. Think mine was actually called T884 for T800 truck with 8 wheel drive & 4 wheel steering. Might be the last really interesting job I’ve had. Think I still have a print of the original layout drawing somewhere. I believe the chassis was either built by FWD or used FWD components. Here’s a slightly newer one – from the early 1940s – on an Oshkosh truck working. Rodger, Thanks for posting this, but note that we do not allow off-site links as is stated below the comment box. When I was a teen growing up in rural Iowa, the nearby town of Lohrville used an old snub-nosed FWD truck to push one of these early rotary snow plows. The original plow engine that had been mounted behind the cab was long gone by the time I photographed it in 1972 and in its place on the chassis was mounted a late ’50s Oldsmobile — yes, the entire baby blue four-door — and the Olds’s V8 engine powered the blower blades. I still have an old Kodachrome color slide of the contraption somewhere in my photo archive. That Climax R6U had a 6″ bore and a 7″ stroke. 125 hp @ 1,000 rpm. However a dash control allowed the operator to over ride the governor which would give you 142 hp @ 1,200 rpm. The article narrative indicates that the fuel consumption was 175 gallons per hour. I think that is a bit excessive. I think that it should be 17.5 gallons per hour. If it were 175 they would have to have a fuel tanker following along behind. John, The article I quoted was 175 gallons not for an hour but every 2-2.5 hours. If it was correct that is between 70-85 gallons an hour to power a hard-working 1200 c.i. engine or less if it was a typo and it was a 75 gal. tank.